Fished a variety of spots on the Cannon around Northfield. Small catifsh, small walleye both at a place I call catfish island. Yet to hit a home run at this spot compared to previous years. NF dam and a place known as Rock Circle known for nice pike was a bust. Drum city. Drum seemed to be the predominant catch. A little high still for wading my fav smallie spots. Only one little guy. Then I stumbled into a new spot. Big wide sandy beach. Big 90 turn, lots of slack water. One catfish after the next. Nothing huge but eater size. Caught a dozen cats in all and that was at noon, bright skies so I was not complaining. Giant clam shells all over the beach. Folks even lined them around campfires had here in place of stone. Maybe it was six hours of hiking and fishing but I swear the four cats I kept were right up there with walleye in taste. Above or below Northfield? Nice kitties!!! Might be in that area soon for a day or two. Below (downstream) Northfield. Ryan give me a shout when in the are. Hopefully we can fish together. If not, can give you some spots to try. Went back to the same spot after dinner. Worms caught me a couple small cats right away. Then I switched to cut bait. 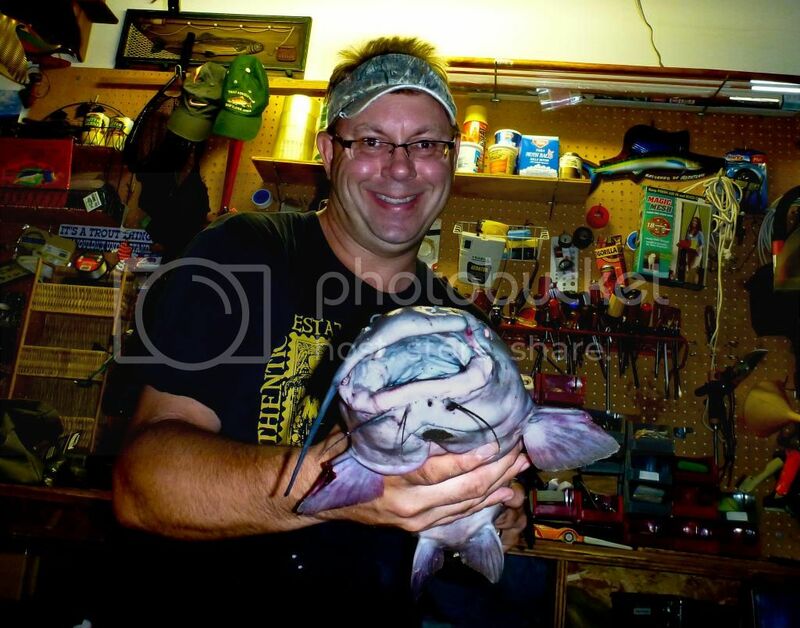 I had my drag set too tight and broke 10# line after I set the hook and it ran. I tried again. Right at 9pm when I was about to leave I felt a couple of small taps. I let it sit for a few then reeled up slowly to call it a night when I felt the weight. Massive fish. Likely the same one that hit the first time, who knows. I played as light as possible although had to apply pressure when he was heading for a log jam. Beached the fish in a few minutes. Barely hooked so I'm glad I did not horse in. Caught on my trout pole. 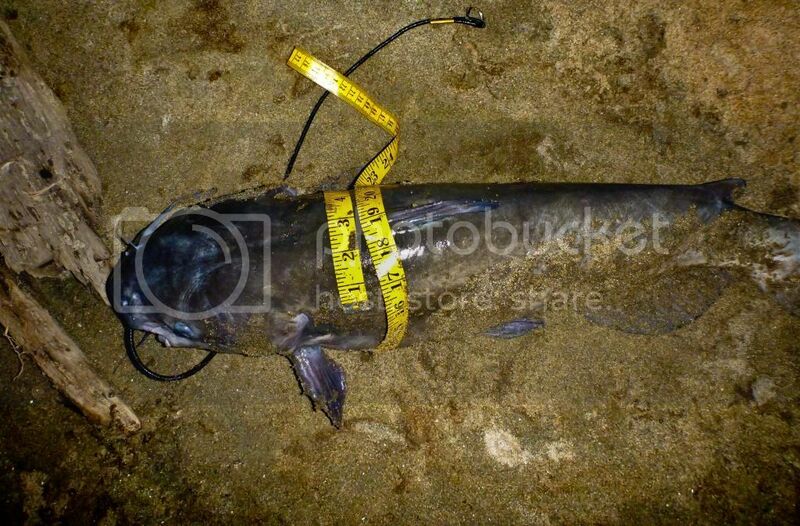 I had my catfish pole in the car but did not think of a big cat. My mistake. 29" x 16" and weighed in at 9#. Giant fillets I chunked up into three bags of meat. Nice fish Mark. 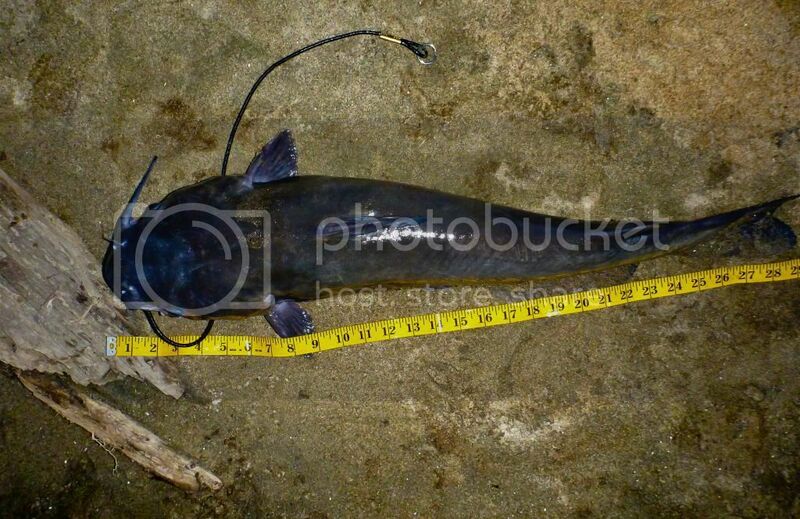 I love Catfish. They are easy to clean and even easier to eat. 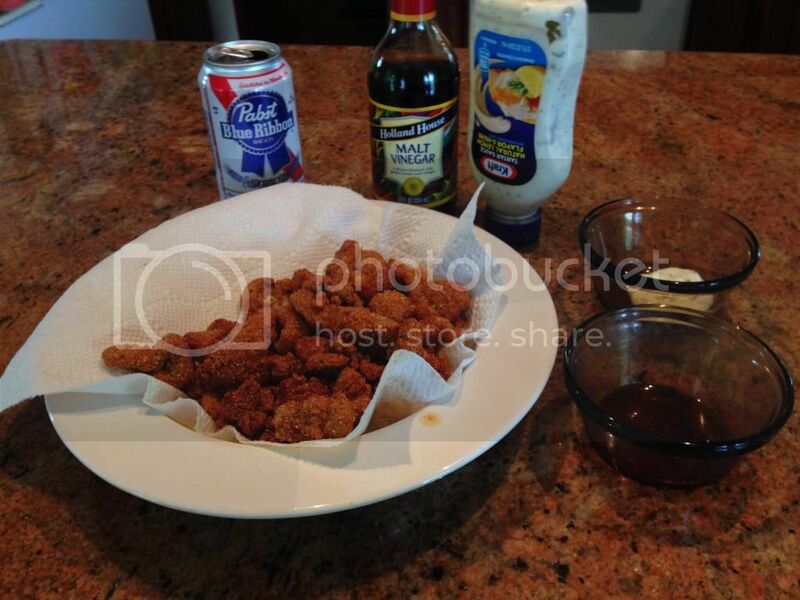 What is with the bowl of vinegar? Never tried it with fish before. Just standard malt vinegar. Standard for Jenn. The Brits and Irish use it more perhaps? So many people think of them as nasty bottom feeders. This weekend taught me they eat on top too. Midges perhaps. Lots of risers early morning. They are opportunists. I bet they eat variety. I've heard of them hitting top water lures too. As for taste I'm so impressed. Sorry folks, trout don't even come close. As for cleaning, I'm still getting the hang of it. Once I get faster at skinning it will be easy. So many people think of them as nasty bottom feeders. This weekend taught me they eat on top too. Midges perhaps. Lots of risers early morning. They are opportunists. I bet they eat variety. I've heard of them hitting top water lures too. As for taste I'm so impressed. Ove the years I've heard some surprising stories about what they'll hit: guys fishing for smallmouths on Lake Michigan with crankbaits or spinners getting their line snapped as if it were thread going back with heavier equipment next time out and catching a big channel cat; local kids catching them at night on buzzbaits. I think you nailed it when you said they are opportunists. There is such a variety of food in some bodies of water and the cats have evolved to take advantage of all of it. I suppose it's possible to find some nasty tasting ones, maybe out of dirty or excessively muddy water. But if the water has any quality at all, channel cats taste great. 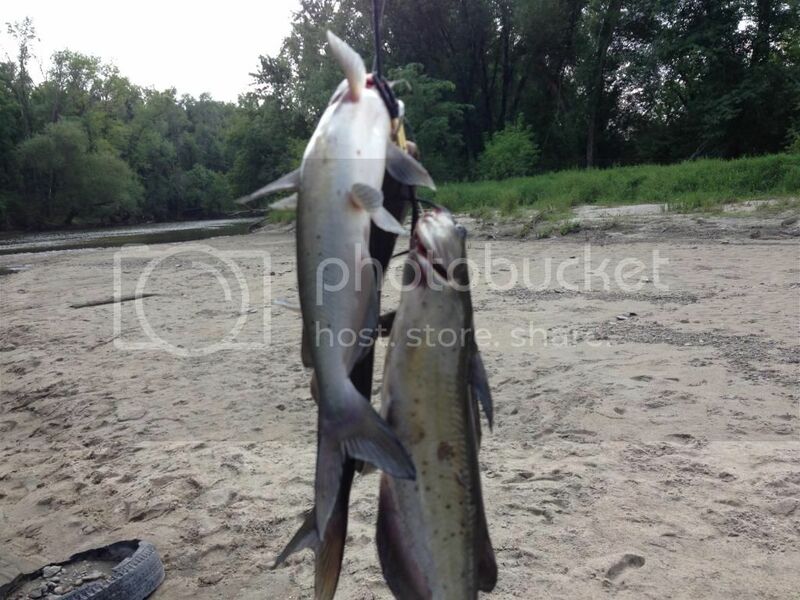 Now you've got me thinking about hitting the Kankakee after work sometime this week to get a few for the pan.